Voice assistants are voice-based conversational interfaces paired with intelligent cloud-based back-ends. The device itself provides basic Natural Language Processing (NLP) and Natural Language Generation (NLG) capabilities, and the back-end intelligence gives these devices AI-powered intelligence. 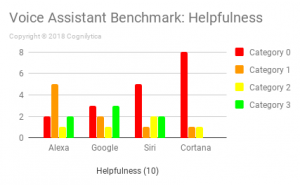 Examples of voice assistants include Amazon Alexa, Apple Siri, Google Home, and Microsoft Cortana. 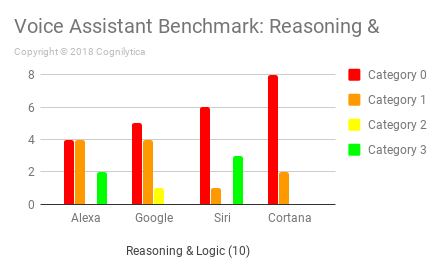 Cognilytica is focused on the application of AI to the practical needs of businesses, and because we believe voice assistants can be useful to those businesses. As such, we need to understand the current state of the voice assistant market. 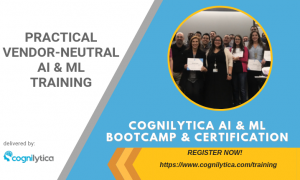 We care about what happens when the NLP does its processing and those outputs are provided as input to an intelligent back-end system. 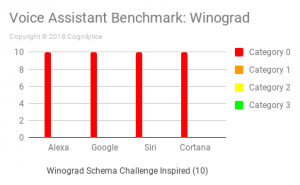 Some vendors are demoing their devices being used to make real-world calls to real-world businesses to perform real-world tasks. This is not just playing music or telling you the weather. This requires at least a minimum level of intelligence to perform without frustrating the user. 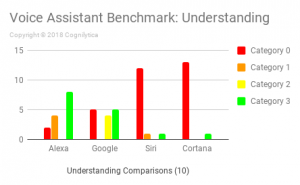 And so, without an understanding of what the limitations of these devices intelligence really are, we’re left wondering what sort of applications these voice assistants are best suited for. We want to know — just how intelligent is the AI back-end? 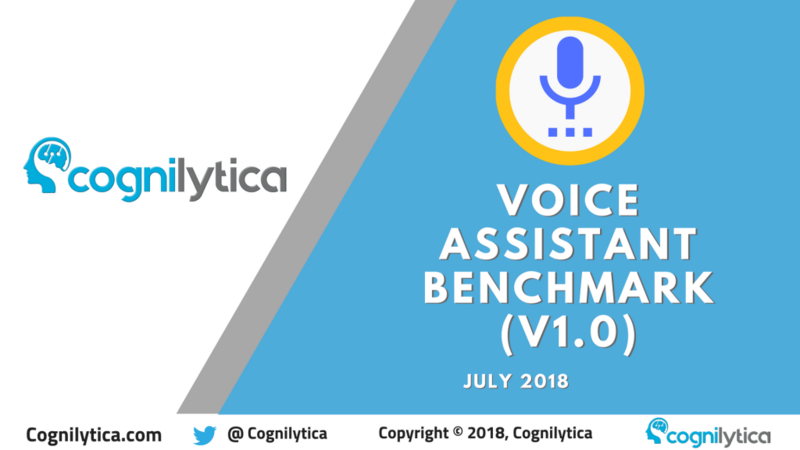 In the current iteration of the Cognilytica Voice Assistant benchmark, there are 10 questions each in 10 categories, for a total of 100 questions asked, with an additional 10 calibration questions to make sure that the benchmark setup is working as intended. To avoid problems relating to accents, differences in user voice, and other human-introduced errors, each of the questions are asked using a computer generated voice. 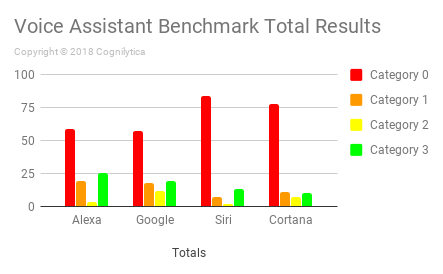 Each benchmark result specifies which computer generated voice was used so that you can replicate the results. Category 1 Provided an irrelevant or incorrect answer. Category 3 Provided a correct answer conversationally (did not default to a search that requires the human to do work to determine correct answer). 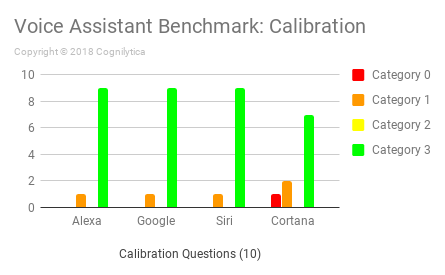 Calibration questions are intended to make sure that each voice assistant provides a response as predicted by the system. 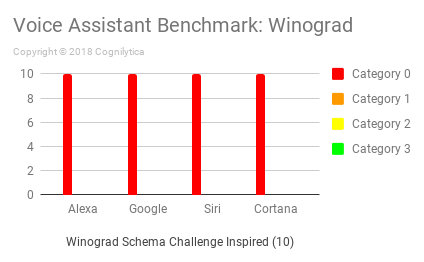 This way we can test to make sure that the benchmark setup is working and that the voice assistants are responding as expected. There should not be any unexpected responses in calibration questions. 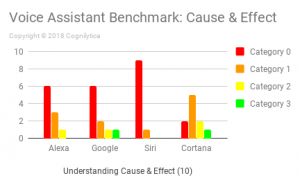 Any anomalies are noted in benchmark results. In order for this to be a fair benchmark we need to make sure that no voice assistant is given an unfair advantage. 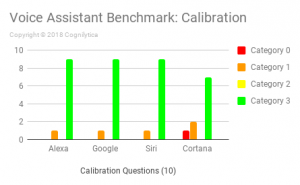 In addition, these calibration questions are used to make sure that each response category is properly identified. 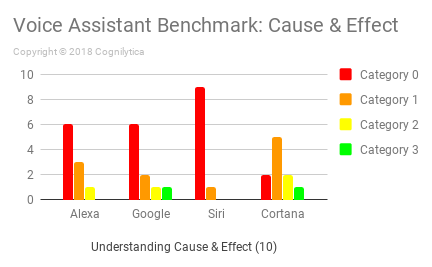 In this latest benchmark, pretty much all of the voice assistants did poorly, not answering questions like “What color is burned toast?.” Curiously, while Alexa and Siri both failed to answer any questions at Category 3, Google and Cortana both answered the question “What happens when you melt ice?” with a satisfactory Category 3 response. 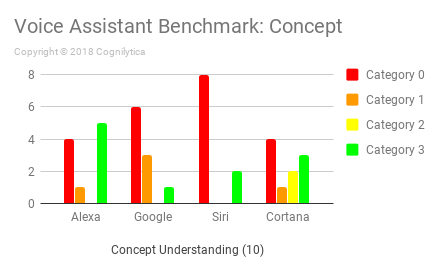 Voice assistants need to be helpful in a wide variety of contexts. These questions aim to find out what sort of non-skill / third-party developer enhanced capabilities are inherent in the devices to provide helpful answers in response to a wide range of questions. These questions either don’t fit into one of the above categories or are additional questions that we didn’t have room to ask above. 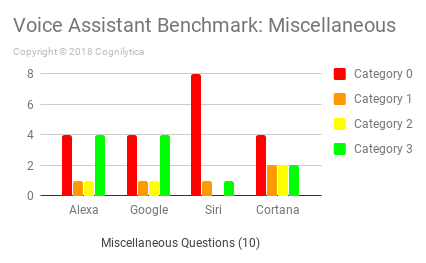 These miscellaneous questions test voice assistants relevant to intelligence, understanding, and helpfulness. As you can see from the above results, as a whole, voice assistants have a long way to go before even half of the responses are in an acceptable Category 3. 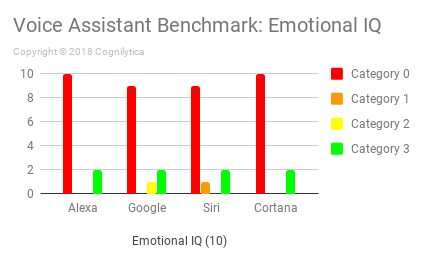 For the current benchmark, Alexa provided the most number of total Category 3 responses with 25 out of 100 questions answered correctly. 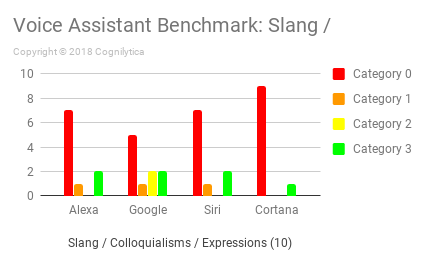 Google follows close behind with 19 Category 3 responses. 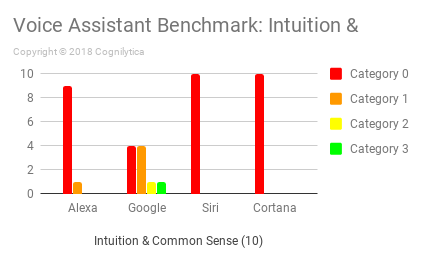 Siri and Cortana trail behind with only 13 and 10 Category 3 responses respectively.